Preprints (earlier versions) of this paper are available at http://preprints.jmir.org/preprint/10726, first published Apr 07, 2018. Background: Nonadherence to antidepressants is a major obstacle to deriving antidepressants’ therapeutic benefits, resulting in significant burdens on the individuals and the health care system. Several studies have shown that nonadherence is weakly associated with personal and clinical variables but strongly associated with patients’ beliefs and attitudes toward medications. Patients’ drug review posts in online health care communities might provide a significant insight into patients’ attitude toward antidepressants and could be used to address the challenges of self-report methods such as patients’ recruitment. Objective: The aim of this study was to use patient-generated data to identify factors affecting the patient’s attitude toward 4 antidepressants drugs (sertraline [Zoloft], escitalopram [Lexapro], duloxetine [Cymbalta], and venlafaxine [Effexor XR]), which in turn, is a strong determinant of treatment nonadherence. We hypothesized that clinical variables (drug effectiveness; adverse drug reactions, ADRs; perceived distress from ADRs, ADR-PD; and duration of treatment) and personal variables (age, gender, and patients’ knowledge about medications) are associated with patients’ attitude toward antidepressants, and experience of ADRs and drug ineffectiveness are strongly associated with negative attitude. Methods: We used both qualitative and quantitative methods to analyze the dataset. Patients’ drug reviews were randomly selected from a health care forum called askapatient. The Framework method was used to build the analytical framework containing the themes for developing structured data from the qualitative drug reviews. Then, 4 annotators coded the drug reviews at the sentence level using the analytical framework. After managing missing values, we used chi-square and ordinal logistic regression to test and model the association between variables and attitude. Results: A total of 892 reviews posted between February 2001 and September 2016 were analyzed. Most of the patients were females (680/892, 76.2%) and aged less than 40 years (540/892, 60.5%). Patient attitude was significantly (P<.001) associated with experience of ADRs, ADR-PD, drug effectiveness, perceived lack of knowledge, experience of withdrawal, and duration of usage, whereas oth age (F4,874=0.72, P=.58) and gender (χ24=2.7, P=.21) were not found to be associated with patient attitudes. Moreover, modeling the relationship between variables and attitudes showed that drug effectiveness and perceived distress from adverse drug reactions were the 2 most significant factors affecting patients’ attitude toward antidepressants. Conclusions: Patients’ self-report experiences of medications in online health care communities can provide a direct insight into the underlying factors associated with patients’ perceptions and attitudes toward antidepressants. However, it cannot be used as a replacement for self-report methods because of the lack of information for some of the variables, colloquial language, and the unstructured format of the reports. The prevalence of use of antidepressants among Americans increased from 7.7% in the years 1999 to 2002 to 12.7% in 2011 to 2014 , with the global market estimated at US $11.6 billion in 2017 . The therapeutic benefits of antidepressants depend on adherence to prescribed regimen; however, between 30% and 68% of patients are nonadherent , leading to increased risks of depression relapse, emergency visits, low quality of life, and significant burdens on the individual and health care system . Several studies indicate that nonadherence is weakly associated with personal attributes and clinical variables, but it is strongly associated with patients’ beliefs and attitudes toward medication [3,5,6]. Identifying the key dimensions of patients’ attitudes toward antidepressants is a challenging task . Although self-report scales for measuring patients’ attitude toward antidepressants are well validated, they are associated with some methodological difficulties (eg, missing factors influencing attitude, sampling bias, and patients’ reluctance to reveal personal information). On the other hand, generic scales such as the Beliefs about Medicines Questionnaire  and Drug Attitude Inventory  that are widely used in many patient groups are not specifically designed to evaluate patients’ attitudes toward antidepressants. Online health care communities have provided patients with a unique platform to report their experiences freely and express their main concerns and perceptions about their treatments. This information may not be collected by traditional self-report methods such as questionnaires, interviews, or physician assessments [10-12]. A public opinion survey found that 30% of Americans actively participate in creating health-related knowledge in online health care forums . This rate is higher among patients with mental disorders, possibly due to stigma against them . With the growing emphasis on patient-centered care, the ability to directly measure individuals’ attitudes toward medications from their reviews in social media may increase early detection of factors that contribute to nonadherence and negative outcomes . To the extent of our knowledge, no study has focused on identifying underlying factors influencing attitude toward antidepressant treatment as reported by patients in online health care forums. The premise of this study is that patients’ self-reports of their experiences with antidepressants therapy on drug review forums may constitute a reliable source to uncover various dimensions of attitude toward these medications. In this study, we utilized the online health care forum called askapatient to identify underlying factors associated with attitudes toward antidepressants. We used a novel mixed-method approach to generate structured data from unstructured text, evaluate the association between attitude and both personal and clinical variables, and model the relationship between the variables and patients’ attitudes toward antidepressants. To achieve the latter, we identified clinical and personal factors from literature that have shown to affect attitude toward psychiatric medications and then used these factors for designing an initial framework of analysis for patients’ drug reviews. We hypothesize that clinical variables including drug effectiveness, experience of adverse drug reactions (ADRs), perceived distress from ADRs (ADR-PD), and duration of treatment are associated with patients’ attitudes toward antidepressants. We also hypothesize that drug effectiveness and presence of adverse effects are the most important factors affecting patients’ attitudes toward medications. Furthermore, we hypothesize that personal variables including age, gender, and patients’ lack of knowledge about medications are associated with the patients’ attitudes toward antidepressants. The methodology of this study is composed of multiple phases. We first generated structured data from unstructured patients’ review using the analytical framework method. Then, we used the structured data to test the hypotheses and model the relationship between variables and attitude. Figure 1 shows the summary of the methodology for this study. The data source of this study is a health care forum called askapatient. This health care forum collects patients’ experiences for a wide-range of medications, along with the patients’ age, gender, reason for drug prescription, and duration of usage. Patients can also rate their satisfactions with the drugs through a Likert scale from 1 (not satisfied) to 5 (very satisfied). For the purpose of this study, we considered the patients’ satisfaction with the drugs as their overall attitudes toward the medications. Patient satisfaction in several studies has been characterized by patients’ beliefs and attitudes [16,17]. In addition, the Likert scale is equivalent to the scales used by attitude studies to present outcome of self-report scales such as Drug Attitude Inventory and Antidepressant Compliance Questionnaire. The drug sources for this study are sertraline and escitalopram from the selective serotonin reuptake inhibitor (SSRI) class, and venlafaxine and duloxetine from the serotonin-norepinephrine reuptake inhibitor (SNRI) class. We chose these drugs because they are associated with a wide range of ADRs and withdrawal symptoms (WDs) that might affect the patients’ attitudes toward the drugs and because they are among the most commonly prescribed antidepressants . We randomly collected 892 drug reviews for the 4 antidepressants that were posted between February 2001 and September 2016. The sample size was calculated using the formula introduced by Barlett et al  for categorical data. We applied stratified sampling procedure so that the proportion of patients in each attitude group (1-5) was an approximate of the full population. As this health care forum does not have an application programming interface, we developed a Web crawler system to collect all the drug reviews from the forum. University of Wisconsin-Milwaukee’s institutional review board exempted this study as the study data are publicly available and no patient consent was required. Figure 1. A summary of the research methodology of the study. IAA: interannotator agreement; ANOVA: analysis of variance; API: application programming interface; IRB: institutional review board. We used the Framework Method to summarize patients’ experience with medications. The Framework Method is a flexible tool that uses inductive, deductive, or hybrid approaches (combination of inductive and deductive approaches) to generate themes for developing highly structured data from qualitative data . In the deductive approach, themes are generated using literature, whereas in the inductive approach, themes are generated using open coding. In this study, we adopted a hybrid method that combines both inductive and deductive approaches for generating themes to analyze patients’ reviews in online healthcare communities. We conducted a comprehensive review of the literature to identify pertinent factors affecting patients’ attitude toward antidepressants. The identified factors were categorized into 5 categories: pharmaceutical treatment, health care system, psychosocial, patient-related, and depression-related factors. These factors were used as the themes to construct a preliminary analytical framework for data analysis. Table 1 shows the categories of the themes and the themes in each category. The details of the themes are available in . A total of 310 drug reviews were randomly selected for analysis using the preliminary analytical framework. Passages of drug reviews that could not be covered by the preliminary analytical framework were discussed in our regular team meeting for generating new themes. The identified themes reflected patients’ experiences with the medications. Using this approach, 8 new themes were generated: WDs, perceived distress from WDs, intentional withdrawal (discontinuation), unintentional withdrawal (missing dose, running out of medication), patient recommendations to others, overall attitude toward medications, problem with financial support, and problem with social support. To reduce the complexity of the data analysis, themes that covered less than 5% of the drug reviews were eliminated or merged with other themes. For example, affordability and partner support were excluded, and general concern and necessity were merged with overall attitude toward drug. Themes that were conceptually related to other themes but difficult to distinguish were merged in the final analytical framework. For example, perceived necessity and perceived effectiveness were merged. We also removed patients’ general attitudes toward medications because they were strongly correlated with patients’ rating (satisfactions) for the drugs. Table 2 includes definitions of the themes and subthemes used in the final analytical framework with examples of patients’ reviews for the drugs. 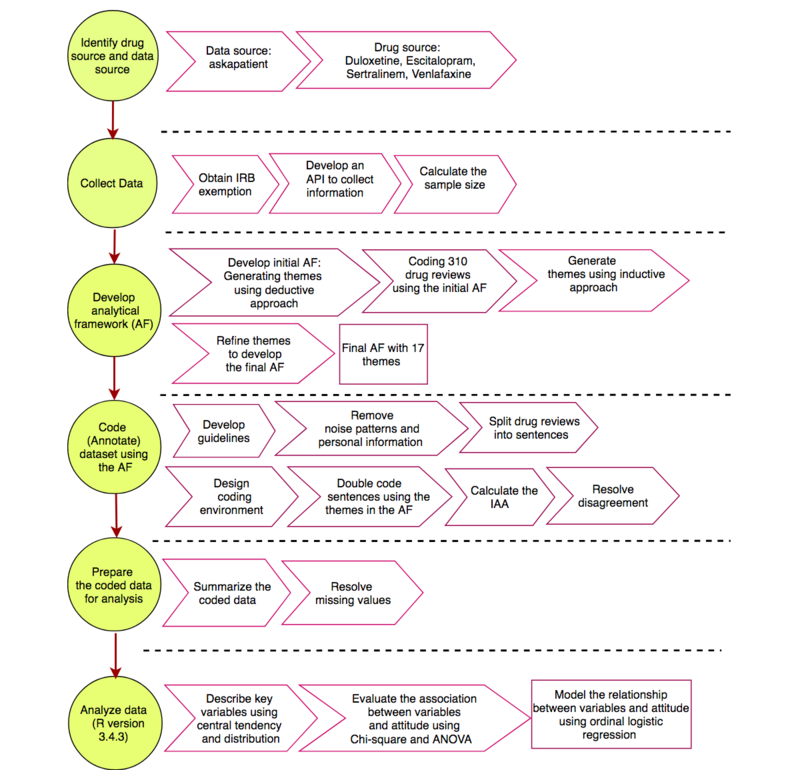 This phase consisted of the following 2 main steps: (1) data preprocessing and (2) annotating the dataset using the themes in the analytical framework. The majority of drug review posts were composed of multiple sentences, each of which covers various aspects of patients’ experiences with drugs. To improve accuracy of data analysis and reduce the observational error, we set the unit of analysis at the sentence level. To split the reviews into sentences, we first addressed the grammatical and punctuation errors in colloquial language using regular expression, and then we applied the Natural Language Toolkit  to split reviews into separate sentences. Table 1. Factors affecting patients’ attitudes toward antidepressants (identified by a comprehensive review of the literature). Table 2. Themes and subthemes used in the final analytical framework with examples. As data analysis was conducted at sentence level, an individual patient’s review may be annotated several times for availability of a theme. To summarize annotation for each patient’s review, multiple expressions of a theme for a single review were reduced to 1. If for a single review, perceived distress from ADRs or WDs was annotated as both high and low, we considered perceived distress-high as the representative of that single review. If a single review was annotated for both effectiveness and ineffectiveness, we retained both expressions of themes. To handle the missing values, we first eliminated all the drug reviews with no text. Any review that did not provide information for the themes (variables) in the analytical framework was also removed from the dataset. The variable “patient-physician interaction” was also removed because of low IAA (50%) and high number of missing values. To handle the rest of the missing values, we adopted different imputation methods depending on the nature of the missing values for each variable. For the variables “age,” “gender,” and “duration of usage,” missing values were imputed under the assumption of “missing completely at random”; that is, the missing values are a random sample of the complete data. The variable “age” was imputed by mean, “gender” by mode, and “duration of usage” by median. For “drug effectiveness,” the missing data were imputed under the “missing at random assumption.” Under this assumption, the missing values were modeled as a function of other variables in the dataset. The k-nearest neighborhood was used for estimating the missing values for this variable. For the rest of the variables, an individual drug review was annotated for the availability of the expression of that value (themes); otherwise, it was labeled as absent. Therefore, the variables did not include any missing values. All analysis was conducted using R version 3.4.3. Descriptive statistics of central tendency and distribution were used to describe the key variables for the sample. Chi-square statistics were used to assess categorical associations. Analysis of variance was applied to study a mix of continuous and categorical variables. Ordinal logistic regression was used to model the relationship between the independent variables and attitude (dependent variable). Alpha value was set at .05 (two-tailed) for assessing statistical significance. Table 3 summarizes the characteristics of the data sample. The drug reviews were posted between February 2001 and February 2016. A total of 5 of the drug reviews did not have any text and were removed from the dataset. Approximately half of the patients were satisfied with the drugs specified in this study, indicating that unsatisfied patients are not dominant in the sample. The majority of the patients were female (680/892, 76.2%), which is in accordance with the report published by the Centers for Disease Control and Prevention showing that 2 times as many women use antidepressants as men . Approximately two-thirds of the patients were aged less than 40 years, implying that younger patients are more willing to report their experiences with medications in online health care forums. Duration of medication usage ranged from 1 day to 20 years. Patients reporting an experience after 1 day might indicate concerns about drug mechanisms. Assessing duration of usage revealed that 37% of the reviews were made by patients in acute phase of depression treatment, 28% were reported by patients in the continuation phase of treatment, and 34% were reported by patients in the maintenance phase of treatment. This information indicates that drug reviews were almost evenly distributed between 3 phases of antidepressant treatment. Table 4 shows the frequency of the variables in the sample. More than 90% of the patients reported that they experienced ADRs associated with antidepressants, whereas more than half reported they were distressed by the ADRs. Almost two-thirds of the patients reported that the antidepressants were effective in treating depression symptoms and improving functional abilities. Almost 30% of the patients reported intentional drug discontinuation, whereas only 5% reported unintentional drug discontinuation. Less than 10% of the patients provided any information on their perceived experience of communication with health care providers; therefore, we removed the variable patient-physician interaction from the data analysis. Analyses of associations were conducted to determine whether patients’ attitudes are associated with any of personal and clinical variables specified in the dataset. The variables “experience of ADRs” (χ24=31.1, P<.001), “ADR-PD” (χ28=231.6, P<.001), “drug effectiveness” (χ28=548.5, P<.001), “complaint about the lack of knowledge” (χ24=59.4, P<.001), “experience of withdrawal” (intentional and/or unintentional; χ24=55.6, P=<.001), and “duration of usage” (F4,874=43.66, P<.001) were strongly associated with patients’ attitude toward medications. However, age (F4,874=0.72, P=.58) and gender (χ24=2.7, P=.21) were not associated with the patient attitude toward the drugs. In summary, the results support the hypotheses that clinical variables (experience of ADRs, perceived distress of ADRs, and drug effectiveness) and personal variable (complaint about the lack of knowledge about medications) were related to patients’ attitude toward antidepressants. However, the results did not support the hypotheses that age and gender were associated with patients’ attitude toward antidepressants. Table 3. Sample statistics for reviews posted between February 2001 and September 2016 (N=892). Table 4. Frequency of variables in the dataset. The variables “age” and “gender” were excluded from this model because they were not significantly associated with the patients’ attitudes toward antidepressants. Table 5 shows the coefficient, the SE, and the P value for the outcome variables for this model. The coefficient for the variables in the predictive model shows that perceived ineffectiveness decreases the log odds of patients’ attitude toward antidepressants by 3.97 compared with perceived effectiveness. For ADR-PD, having ADR-PD low versus high changes the log odds by 1.93. For duration of treatment, for every additional day of treatment, the log odd of attitude increases by 0.0002. For the variables “experience of withdrawal,” “complaint of the lack of knowledge,” and “experience of ADR,” for every unit change in this variable (absence vs presence), the log odds of attitude changes by −0.7, −0.4, and −0.5, respectively. The results support the hypothesis that drug effectiveness is the most important factor affecting attitude toward antidepressants. Experience of ADRs compared with perceived distress of ADRs is a less important factor. A patient’s attitude toward antidepressants is influenced more by perceived distress received from ADRs than experience of ADRs. bADR-PD: perceived distress from ADRs. Table 5. Coefficients of the variables in the predictive model. In this study, we explored usability of the patients’ self-report experience in an online health care forum to generate hypotheses concerning the association between personal and clinical variables with attitude. We used a mixed-method approach to generate structured data from unstructured text, evaluate the hypotheses, and model the relationship between attitude and the identified variables. Our findings showed that in line with the literature, drug ineffectiveness [24,25], experience of ADR [26-28], lack of knowledge [29,30], and duration of usage were associated with negative attitude toward antidepressants. Association between variables “patient-physician interaction” and attitude was not tested in this study because of low IAA and high rate of missing values. The demographic variables “age” and “gender” are not associated with levels of attitude. Our findings for age and gender are in agreement with the findings of the studies conducted by Jacob et al , Murata et al , and Ng at al . However, these findings are in contrary to the findings of the study conducted by Prins et al . Data analysis of this study showed that drug review posts in social media provide significant insight into patients’ perceptions and attitudes toward antidepressants as well as the pharmacological factors. However, they may not provide significant insights into patients’ intentional nonadherence because the key factor in defining adherence is the patient’s agreement with the health care provider’s treatment plan. Thus, further inquiry may be needed to determine whether the antidepressant discontinuation was in consultation with clinicians. The findings of this study have significant implications for developing clinical interventions aiming to improve patient attitude and adherence toward medications. One major finding is that patients’ lack of knowledge about drug mechanism and potential adverse effects may negatively influence patient attitude toward antidepressants. Prescribers are therefore well advised to inform patients about the potential risks of antidepressants and assist them in achieving realistic expectation of the treatment. Another major implication of this study is that perceived distress received from ADRs and WDs are significant predictors for patients’ attitude and in turn, medication adherence. Clinicians could encourage patients to record adverse effects and their impacts on daily functioning to identify the patients’ actual experience with the drugs. This information may help clinicians tailor interventions to improve patients’ perception of medication and consequently adherence to the antidepressant treatment. Moreover, because patient attitude toward antidepressants are shaped by perceived drug effectiveness, and antidepressants’ full effects are not seen for typically 4 to 6 weeks, clinicians should track patients’ response and encourage them to complete an adequate trial. Several studies have shown that physician support can significantly improve patient attitude and adherence toward medications. The dataset generated using the analytical framework can be used for designing a patient-driven self-report scale for measuring patient attitude toward antidepressants. This dataset shows how patients express their concerns, complaints, and feelings about pharmacological effects of antidepressants. Ultimately, using this colloquial language in designing self-report scale may reduce the risk of patient misinterpreting the questions. The methodology of data analysis and the analytical framework developed in this study have significant implications for data analysis of patient experiences with pharmacologic agents collected in other health care forums or reported through patient portals. Although patients’ self-report experience of the medications provides a significant insight into underlying factors affecting attitudes toward medications, self-reported information is not a rich source of patients’ perceptions toward health care providers, general perceived need and concerns for medications, and perceived social support. In contrast, the Antidepressant Compliance Questionnaire and the Beliefs about Medicines Questionnaire scales measure these factors using a self-reporting method. Overall, drug reviews in online health care forums cannot be used as a replacement for self-report scales measuring patients’ attitudes toward antidepressants. However, they can serve as a supplementary source for measuring patients’ attitude toward antidepressants. This dataset spans from 2001 to 2016. Although this dataset provides a general picture of the underlying factors affecting patients’ attitudes toward antidepressants, it does not reflect the changes in prescribing guidelines for antidepressants during the 15 years. Changes in the antidepressants’ dosages can affect patients’ experiences with ADRs and perceived effectiveness of the drugs. Future studies can compare the trend of patients’ attitudes toward antidepressants and changes in prescribing guidelines. The sample of this study includes a combination of patients’ experience in acute, continuous, and maintenance phases of antidepressants treatment, ranging from 1 day to 20 years. Although combining and analyzing patients’ experiences in different phases of treatment can provide an overall insight into the factors affecting patients’ attitude to antidepressants, it does not provide precise information about the underlying factors affecting each specific phase. Future studies may focus on a specific phase of antidepressant treatment to identify the underlying factors and compare the findings between the phases. There is the concern that findings of the study may mostly reflect patients’ experiences at the maintenance phase of the antidepressant treatment. However, the statistics on the sample show that 37% of patients reported duration of treatment of less than 3 months, 28% reported between 3 months and less than 1 year, and 33% of the patients reported less than 1 year. This statistic indicates that the sample is a good representation of patients in different phases of treatment and long-time users are not dominant. Although the patients’ experiences with the medications are different and patients with longer experience may provide more information about the antidepressant, the majority of the patients provided information for the variables (themes) used for data analysis of this study. Although the result of this study may be generalized to other antidepressants from the SSRI and SNRI class, it may not be generalized to other classes, such as the tricyclic antidepressants or the norepinephrine and dopamine reuptake inhibitors, as the ADRs and WDs may be different. Since we collected the data from a single health care forum, there is a risk that the findings are not representative of patients in other online health care communities. The review posts in an online health care forum may also not be a representative source for all demographic groups. Some minorities, poor, or elderly patients may lack the literacy, access, or skill to report their experiences in an English-speaking online health care forum. Although online health care forums provide a platform for patients to report their perceptions and attitudes toward medication freely, the risk of inaccurate reporting and false information cannot be eliminated. Even though the dataset is double coded, there is the possibility that annotators did not interpret a sentence correctly and therefore assigned it to a wrong theme. Although patients in the health care forum reported their major concerns about medications, the forum does not prompt patients to report their experience with withdrawal or drug effectiveness. Therefore, some patients may not report their experiences for the variables, causing bias in data analysis. Finally, there is a concern for negative response bias as the patients voluntarily choose to share their experience online. However, almost 50% of patients in this study were satisfied or highly satisfied with their antidepressant medications, compared with only 35% of patients who were dissatisfied or highly dissatisfied. In addition, nearly half of the reviewers used the antidepressants for more than a year. Both findings suggest that the reviewers were not the most dissatisfied patients using antidepressants in this health care forum. Several future research directions are suggested by the results. First, the analytical framework developed in this study may be applied for analysis of patient self-reported experiences for other types of medications. Analyzing data using this framework can assist researchers in identifying underlying factors associated with patients’ attitudes and perceptions as well as medication discontinuation. Another area for inquiry is to identify and normalize patients’ expressions of ADRs and WDs of the antidepressants, then measure their associations with patients’ attitude. Current studies measuring adverse effects associated with antidepressants use the Antidepressants Side-Effect Checklist, which does not include a comprehensive list of the ADRs. Exacting the ADRs from patients’ experiences may address the limitation of the self-report scales. Finally, the dataset generated in this study can be used for training text mining algorithm and machine learning systems to automatically extract from patients’ expressions, the wide range of information related to adverse effects of drugs. In this study, we showed that self-report experiences of a drug by patients in an online health care forum could provide a unique insight into identifying underlying factors associated with patients’ perceptions and attitudes to antidepressants. However, it cannot be used as an alternative for self-report scales and interview methods due to its lack of information for some of the variables, colloquial language, and the unstructured format of the data. The data analysis also showed that drug reviews might not be a reliable source for predicting patients’ intentional nonadherence behavior. Further inquiry may be needed to determine whether the medication discontinuation was in consultation with clinicians or not. This research was supported by the Intramural Research Program of the National Institutes of Health, National Library of Medicine and Lister Hill National Center for Biomedical Communications. The authors would like to thank Jiaxi Zhu, MPH; Soo Kyung Park, MPH; and Margaret Downs, MS, for their significant contribution to preparing the dataset of this study. The authors also thank their colleagues from National Library of Medicine and University of Wisconsin-Milwaukee who provided insight and expertise that greatly assisted this research project. ©Maryam Zolnoori, Kin Wah Fung, Paul Fontelo, Hadi Kharrazi, Anthony Faiola, Yi Shuan Shirley Wu, Virginia Stoffel, Timothy Patrick. Originally published in JMIR Mental Health (http://mental.jmir.org), 30.09.2018.